In this cut-out-and-keep guide on "How To Brexit" from Matt Forde explains how to leave a customs union. 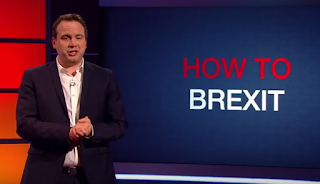 The new series of Unspun with Matt Forde continues Wednesdays at 10pm on Dave. One of the most exciting voices in political comedy returns to Dave with a brand-new and exclusive run of the show that once again provides a topical, fearless weekly look at the world of Westminster and beyond. Recorded the day before airing, this UKTV Original features reactions to the fast-changing news agenda, interviews with leading political figures and additional reporting from international comedians including Andy Zaltzman and Phil Wang and music from Matt’s house band MP4, the world’s only parliamentary rock group whose members are all serving, or former politicians. At the heart of each Unspun With Matt Forde will be an in-depth discussion with one of Britain’s leading political figures. Fresh from the news of Brexit, series one saw Matt grill some of the UK’s most talked about politicians including Chuka Umunna, Ruth Davidson, Nick Clegg and Anna Soubry. Guests for this second series are still TBC. Unspun With Matt Forde takes an irreverent look at politics and politicians in 2017, a time where political satire has never been more essential.